Schoolgirl rocker anime K-On! isn't only getting a feature film, in which the girls travel to London. It's also getting a convenience store. This is it. In Japan, convenience stores not only sell food and snacks, but an array of necessities (boxers, anyone?) and also double as a place you can send letters, order gifts, buy movie and concert tickets, and even pay your utility bill—as well as standard (and separate) ATM services. Because Japanese convenience stores, or "konbini" in Japanese, are such hubs, this is why game and anime makers, like Square Enix, don't hesitate to to launch themed goodies, such as Dragon Quest Slime. That's why K-On! is once again getting a konbini send off. 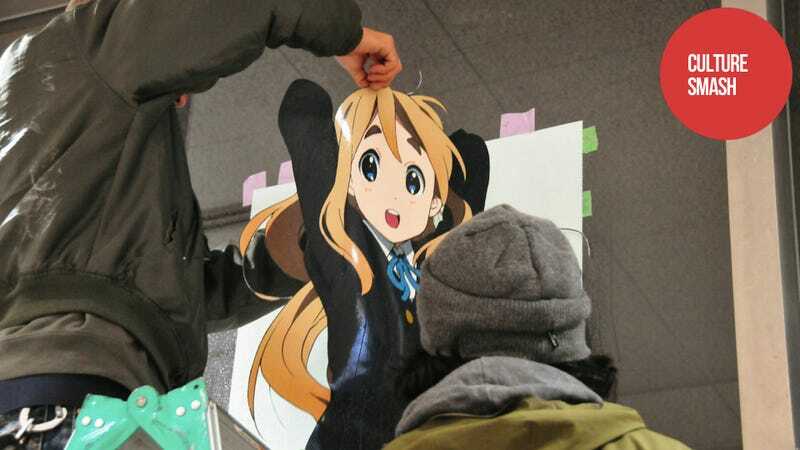 Previously, Japanese chain Lawson held a "K-On! Fair". To promote the film, one Lawson in Osaka near Universal Studios Japan is being decked out in K-On! gear. Lawson, like Japan's biggest conbini 7-Eleven, isn't originally from Japan. In 1939, the first Lawson's dairy store opened in Ohio. The first Lawson opened in Osaka during the 1970s, and today the Lawson stores are Japanese owned and operated. In case you missed it, here is another themed Lawson. This one is for Doraemon creator Fujiko F. Fujio. In the above gallery, pictures, courtesy of website Gigazine, show how the convenience store is covered in K-On!. Ladders and dudes in hats are involved. More photos on Gigazine, and K-On! The Movie opens on Dec. 3 in Japan.